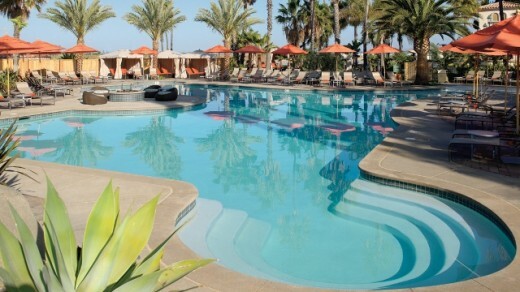 The Hilton San Diego Resort & Spa on Mission Bay is inviting locals to drop in on Sundays for a little poolside R&R. “We hope to do this for locals every summer,” said resort spokeswoman Lisa Campbell. Locals who’d like to extend their fun can get half off all available rooms on Sunday nights, through Sept. 4. (Add $28 for overnight parking; daytime parking is free.) The hotel’s 357 rooms were renovated in 2007. All have patios or balconies and floor-to-ceiling windows; some suites have expansive patios with firepits. You’ll need a valid San Diego ID to get the deal and it’s available only to those 21 and older. Set on 18 acres of lush tropical gardens and rolling lawns, the resort has its own sandy beachfront and a private dock where guests can rent equipment for nearly every land or water sport imaginable. There’s a luxe full-service Spa Brezza, a fitness center, five tennis courts and a jogging track – though jogging along the path that stretches along the bayfront is likely to be far more interesting, especially on Sundays, when roller-skaters gather for a dance jam on a wide swath near the hotel. The hotel is at 1775 East Mission Bay Drive. For reservations, phone 619-276-4010 or go to www.sandiegohilton.com. This entry was posted in Attractions, Hotels & Places to Stay, Insider Tips and tagged diegans, diego, locals, only, pool, san, summer by Alison. Bookmark the permalink. Wow – such a deal!! You can’t beat free! And one of the nicest locations in San Diego. It’s about time local retailers thought about us citizens. Fantastic INSIDER TIP – thanks to this writer, Alison, for spreading the word. Any more? What a generous offer from the Hilton to allow us locals to enjoy the pool. Great tip our family will take advantage of! sign me up … sounds terrific!